“Why should I not put my betta in a betta fish bowl?” you ask yourself. “After all, they sell “betta bowls” in pet stores so bowls must be suitable for bettas. Unfortunately it is not that simple. 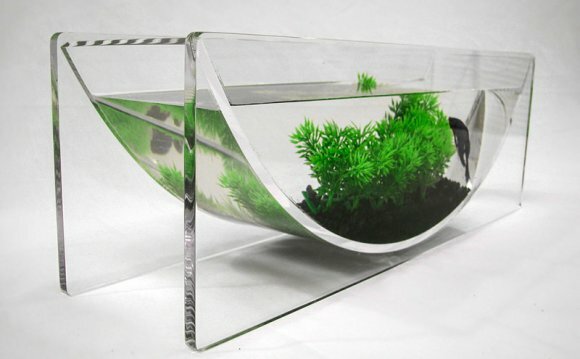 Of course it sounds great to be able to put a small bowl or tiny tank on your desk with a fish in it. The demand for it is there so people will buy it. Unfortunately bettas do not belong and do not thrive in bowls. Don’t believe everything you see in stores and question what your local big box store employee tells you. A betta bowl is not a good idea for any fish. 1. It is tiny. Not enough room to swim in. Bettas can get up to 3″ long when adult. 3. All fish produce ammonia which is a poison to them, in any small amount. In a tiny volume of water, that ammonia can get intolerable in a very short amount of time. In a larger volume of water, there is more to dilute it. I like to compare it to sugar. A tablespoon of sugar in 1/2 cup of water is deadly sweet. Add that tablespoon into a gallon and you may not even taste it. But sugar is sweet. Ammonia burns fish’s gills, add to that the urine and waste that they produce every day–with a small volume of water to dilute this...well I think you have imagination enough to finish that sentence. 4. In a larger tank (for bettas a 3 gallons tank is the minimum, 5+ is better) beneficial bacteria is developed that converts that toxic ammonia to nitrite (toxic in itself) and then to nitrate (not toxic below 40ppm) so that the fish never has to deal with swimming in poisonous waters. 5. Many bowls are not large enough for heaters and bettas are tropical fish and need warm temperatures to flourish. 75-85F (24-29C) Heaters also keep the temperature stable–fluctuating temperatures are really bad for fish. 6. Most bowls cannot accommodate a filter. Filters help clean the water and provide more area to grow your good bacteria. Even bettas, who do not do well with turbulent water, need a filter. If you do find a filter that can go into your bowl (and there are small ones) there is no place for your betta to get away from the movement since a bowl is so small. 7. Bettas need a full hood on their tanks. They can jump upto 6 inches in the air. Bowls are very difficult to cover. Many people who have bettas in bowls come home one day to find their finny friend on the floor. Hopefully I have given you enough reason not to try and put your new friend in a bowl. Sure, plenty of fish survive in marginal situations. The question is, do you want them to survive or do you want them to live happily to a ripe old age? I know, because I fell for the pet store line when we first got our betta. The difference in personality when we got smart and transferred Neptune into a heated, filtered, cycled 10 tank cannot be believed. In his bowl, he would swim halfheartedly, mostly he just had his nose at the surface of the bowl (and we had no ammonia, I tested the water religiously and changed some water twice a day). When we put him in his tank, he was so happy he swam around investigating every corner for two whole days...wagging his tail like a dog whenever we came into the room, rushing over to the edge of the tank to say hello, expressing joy in his every movement.